Looking to celebrate summer with a bang? Look no further than Silver Dollar City, White Water and the Showboat Branson Belle. Each of these three Branson attractions is hosting spectacular fireworks displays* this summer – and we’ve got all the information you need to ensure you don’t miss a show! Few things say “Happy Birthday, America” better than fireworks lighting up the night sky. If you’re looking to see a show on the Fourth of July, the Showboat Branson Belle is your destination. It’s our only attraction with a fireworks display on Independence Day, and it’s scheduled during our 8pm cruise. The fireworks won’t be the only entertainment on the menu. After the display concludes, you’ll be treated to the Showboat’s variety show featuring talented singers, dancers and a live band performing hits from the 1960s to today. You’ll also enjoy a delicious three-course meal fresh from the ship’s galley. 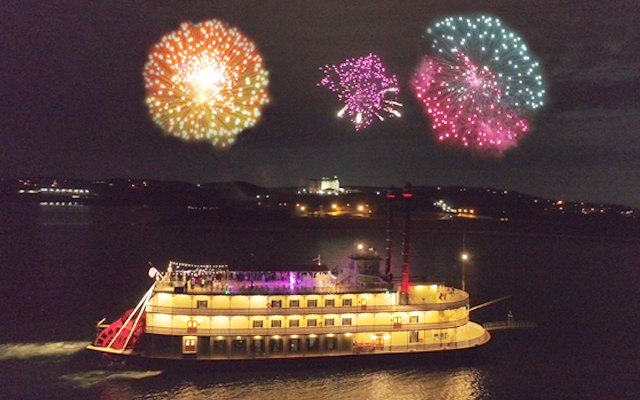 The Independence Day cruise is one of six special “Fireworks Finale” nights the Showboat Branson Belle has planned this July. Every Sunday night from July 1-29, there will also be a fireworks display during the 8pm cruise. All Fireworks Finale nights include the variety show, meal and a cruise on Table Rock Lake. EVEN BETTER: Silver Dollar City, White Water and 2-Park Season Pass Holders can purchase general seating tickets to any Fireworks Finale cruise for just $30+tax. Don’t miss the boat — get tickets today! If you’re looking for the attraction with the highest number of fireworks displays, you’ll want to visit Silver Dollar City! 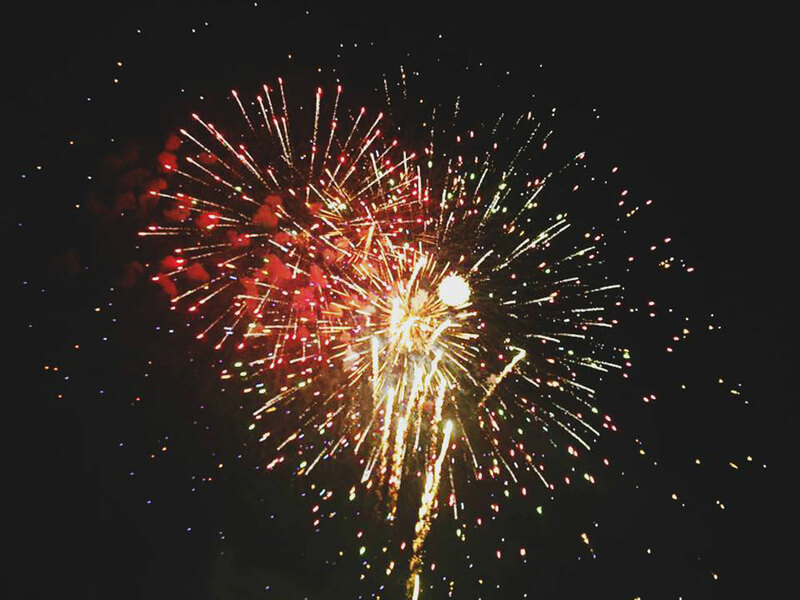 Every night from July 21 through August 5, the Hits From The Hollow variety show concludes with a remarkable Moonlight Madness Fireworks Finale presented by Humana®. 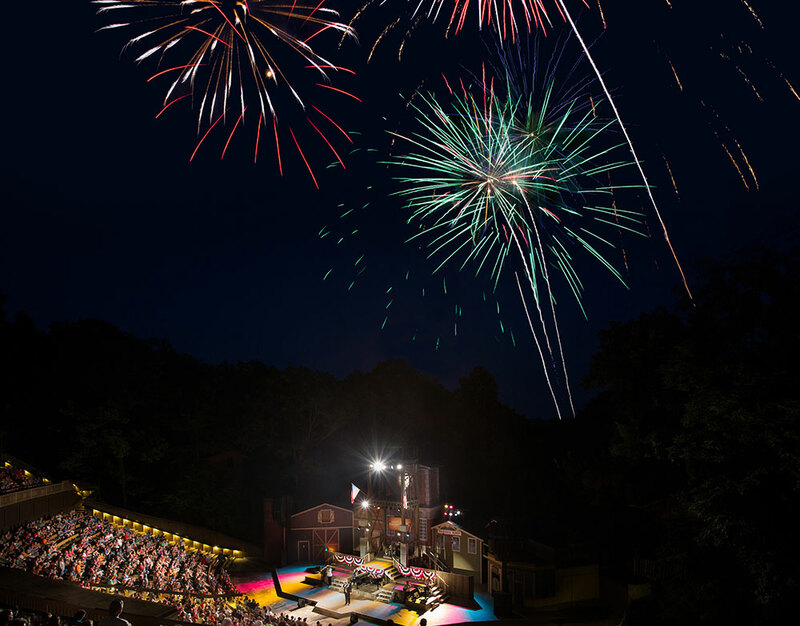 Hits From The Hollow begins in Echo Hollow® Amphitheatre at 8pm every night during Moonlight Madness, and the fireworks show begins at approximately 9:10pm. The only place to view the display is in the Amphitheatre, so make sure you get a great seat for both the variety show and the grand finale! If you want to make the evening even more special, book your seat for Dessert on the Porch at the Midwest Living® Culinary & Craft School, select nights during Moonlight Madness. You'll get a bird's-eye view of Hits From The Hollow and enjoy a delicous homemade dessert. Then relax in a rocking chair and marvel at the fireworks in the night sky. Seating is limited - book today. Silver Dollar City will be open until 10pm or later every night during Moonlight Madness, so you’ll still have time to ride into the night on more than 40 thrilling rides and attractions. This year we’ve added the World’s Fastest, Steepest & Tallest Spinning Coaster — Time Traveler™ — and the record-setting loops, spins and drops are even more incredible after sunset. Make plans to stay up late and visit us! SEE THEM ALL: A Silver Dollar City Season Pass is the ultimate value for fans of great entertainment. At less than the cost of 2 one-day tickets, you can enjoy unlimited visits and shows at the park all season! If you’re looking for a new fireworks display, you have to see White Water! Every Saturday from July 7 to Aug. 4, the 13-acre water park will illuminate the Branson strip with a new and awe-inspiring show. The park is open from 10am to 10pm on July 7, 14, 21 and 28 and Aug. 4, with the fireworks display starting at 9:45pm. That means you can ride and slide all day on thrilling attractions like Kalani Towers, KaPau Plummet and Ohana Falls, then sit back, relax and watch the fireworks light up the rides. SPLASH AND PLAY: If you’ll only be in town for a weekend, consider our special Splash And Play tickets. You can enjoy unlimited visits to Silver Dollar City and White Water for any three days in a five-day span. Tickets are just $31/day for adults and $23/day for children, a great value for a summer getaway! *All fireworks displays at Silver Dollar City, White Water and Showboat Branson Belle are weather permitting.